Are you looking for something different in your movie watching experience – such as the glorification of Nice Guy syndrome, to the point where the line between “I’m just doing what’s best for you” and outright stalking is uncomfortably thin? Where the exploitation of a teenage girl’s mental anguish is a secondary plot to the way our male hero feels about her mental condition? Then do I have a treat for you. For your enjoyment, I present Male Privilege: The Motion Picture. Now I might sound like I’m being facetious in the previous statements, but I’m being honest: it’s really only a mild glossing over of the events in this film. I don’t think I can overstate how awful this story’s attitude is towards women, its romanticization of stalking, and its lack of respect towards consent. 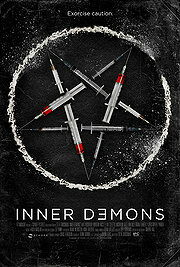 I sincerely felt dirty after watching it; it’s that bad. Much has been said about Sion Sono’s masterful film Suicide Club and its biting social commentary on Japanese society. 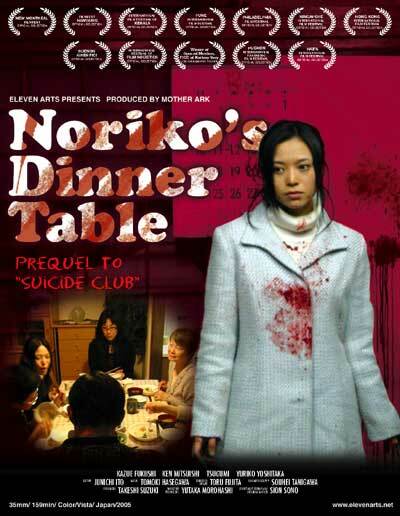 Less, however, has been said of its quiet follow-up film, Noriko’s Dinner Table. This is a shame – while it lacks the violent and shocking nature of the first film, its social critique may be perhaps even more severe and jarring than that of Suicide Club. The story follows Noriko, an average girl who feels bored with her small town life, and craves the adventure and excitement of the city. She dreams of moving to Tokyo after finishing high school, but her father is strictly against this, alienating Noriko further and pushing her towards the company she finds on a mysterious website. Having found companionship with a girl who goes only by Ueno Station 54, Noriko decides to run away from home to join her. However, when she reaches her destination, her friend is not what she seems, and Noriko is brought into a world she did not expect. Mirrors have a long history of superstition and lore surrounding them – some cultures believe in their ability to trap souls, and others believe they can be a gateway into another realm when used correctly. On a smaller scale, I believe most of us have had at least one encounter with a mirror game as children; Bloody Mary was one of the most common ones in my memory. All things considered, it’s no surprise that the horror genre has latched onto the mirror as a tool for conveying terror and supernatural activity, to the point where it’s almost shocking when a film does not make use of a mirror gag. 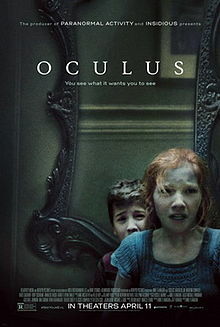 Oculus takes the next logical step in this fixation, and makes the mirror itself the central focus of the horror in the story. Rather than allowing the mirror to take a secondary position as a gateway, or a form of communication, it makes the mirror a vessel of evil in and of itself. In doing so, it attempts to play on the characters’ and audience’s sense of truth, perception, and reality – and twist them all into unrecognizable shadows of themselves. Pregnancy can be a terrifying concept. When I was younger, I envisioned it as something living just under your skin, that knows things, and is biding its time until it can burst out of you in an Alien-esque shower of blood and viscera. I’ve since (mostly) outgrown this, but well done horror involving pregnancy can still freak me the hell out.